Ever watched a baby learn how to walk? I’ve had the privilege of a front row seat to this phenomenon four times. And every once in a while I’d marvel at how they struggled, how they pushed through each phase of learning, from rolling over to running, how they failed and fell – often in ways that would leave a grown-up feeling bruised – and each time they got back up again and kept trying. I feel like that in life plenty of times. In my writing. In friendships. In parenting. In keeping my house clean. In singing, or painting, or cooking – pretty much anything I put my hand to, it’s inevitable that I’m going to fail at it at some point. I used to think failure was the end of the world. But I realized as I failed more and more and lived through it that the world wasn’t over. Then I had this choice: would I let failure cripple me, or would I keep trying until I got it? I’d like to say that I’ve chosen right every time, but I’m still working on this. Still falling down and getting back up again. Sometimes you’ll stay down longer than others. Life has been pushing me pretty hard these past few weeks, and I’m just now feeling like I can get steady on my feet again. And this is me getting back up again. Watch me walk! What about you? What have you given up on because you were afraid to fail? Is it time to get back up again for you? 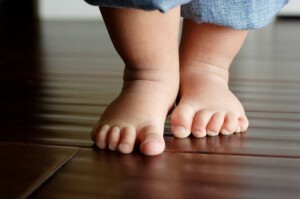 You never know, you might not just learn to walk. You might learn to run. Thank you! This is just what I needed this morning! Turning failure into a challenge is a great way to look at it. Thanks! 🙂 I need the reminder every day, too. I have a problem following through. I feel like if I had a few more minutes in the day I could accomplish so much more.